ON SALE! 25% OFF the original price of $129.95. Sale applies to in stock items only. 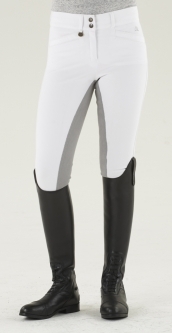 For a cooler, more comfortable ride-you can't beat these breeches. The Aqua-X Breeches are made of MIPAN(R) Aqua-X lightweight woven Nylon/Lycra fabric that is soft, yet tough and durable. Featuring the newest, most technical fabric from the world leader in technical yarns. Aqua-X is the ultimate for summer activities, where sweat absorption and UV protection are required. They offer cool-to-touch finish, UV protection, high absorbency and are extremely quick drying. This fabric composition combined with the Slim Secret cut that features a secret tummy-flattening panel to give a smooth flat look to hips and stomach marry two of the best features around! Silicone knee patches provide stick and grip when needed and drt-tex tube bottoms with elastic ankles allow you to stay cool and dry under tall boots and half chaps. Avaialble in Ladies 24-34 Regular length only in Neutral Beige (pictured) or Charcoal Grey (dark grey).